Rhys’ take on Niagara’s Specialized Transit! Here’s a fantastic example of an outcome influenced by public opinion and concern. It goes to show that you should always try and let your voice be heard! Hello my name is Rhys Evans I am currently a 24 year old Niagara College student currently enrolled in the Social Service Worker program. I am also a graduate of Niagara College’s Recreation and Leisure as well as Recreational Therapy programs. I value staying involved in my community by doing things like representing the town of Pelham on the Joint Accessibility Advisory Committee and participating in wheelchair basketball. The Region of Niagara recently awarded BTS, a company from Vaughn, the Niagara Specialized Transit contract for transporting people with disabilities to medical appointments, school or employment. Part of the agreement was a proposed fare increase for riders, many of who are on fixed or reduced incomes. In some instances the increases would have been as great as 300%. I got a letter in the mail along with other users to inform us of these changes. I was unhappy with the lack of any consultation, or any transparency in how this had been done. l was also angered by the proposed increases that would further limit people’s independence. I firstly contacted the Mayor of Pelham, Mr. Dave Augustyn with my concerns. I also used social media, letters to the local paper and spoke to the Joint Accessibility Advisory Committee (that I am a member of), in order to urge the council to reconsider the proposed increases. Regional Council of Niagara discussed the concerns voiced by users like myself that were presented at their June 28th meeting, and made the decision to suspend the increases, and revisit the issue in 2017. This date was chosen because the Accessibility for Ontarians with Disabilities Act ( AODA ) will have enacted the Transportation Standard that will provide a clearer framework about what fare charges should be. The expectation is that fares will become more affordable for Ontarians with Disabilities. Whatever the outcome, it is hoped that there is full consultation with the user group before any final decision is made, because no such consultation occurred this time, and if things had remained unchallenged many users may not have been able to continue with this vital service. In the meantime those using the system are grateful to Regional Council that they can still attend medical appointments, therapies, and school or work at a reasonable cost. As a user and member of the Joint Accessibility Advisory Committee, I shall continue to monitor the progress on this issue and make the public aware of any future developments. “Yesterday, there was a forum concerning issues of accessibility and disability. 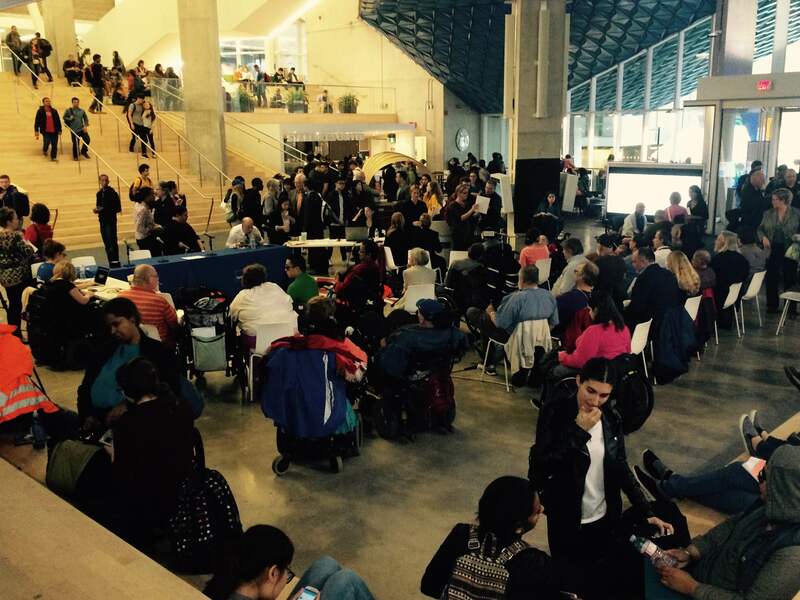 Federal election candidates from various Toronto ridings were present to discuss their party’s platform regarding disability and accessibility. Mike Sullivan represented the NDP, Arnold Chan. the Liberal Party and Sharon Danley, the Green Party. The conservative party was contacted, but no member volunteered to come and speak to those issues. As for the discussion itself, there were several key points that I found intriguing. Primarily, all parties insisted that the largest adversary to the disability/accessibility movement is the Conservative government. Each federal representative said that the largest obstacle to adhering to the UN Convention on Rights of Persons with Disabilities has been the Conservative government. All parties, except the Conservatives, have vowed to fulfill its international (and ethical) commitments. Furthermore, the NDP and Green party explicitly stated that they intend to create a national policy on accessibility and disability (Canadian Disabilities Act). Although Arnold Chan also expressed a desire to legislate such an act, he was not able to comment whether it was on the executive’s (Trudeau and his potential cabinet) agenda. Secondly, I was astounded at the depth of the questions. To be clear, this discussion was specifically designed to appeal to persons with disabilities. Some of the questions designed covered topics including a Canadian Disabilities Act (CDA), physician-assisted suicide, a national housing strategy, disability representation in the HoC, adherence to the UN conventions and an increased pressure on provincial governments to administer better services. Each speaker outlined his/her party’s policy concerning the aforementioned issues. Many candidates repeated old adages of “equality of service”, “reducing poverty”, “more consultation with community agencies and persons with disabilities”, “more adaptive equipment” and “an attitudinal shift”. However, both Sullivan and Danley offered more substantive policy changes should their parties be elected. Sullivan expressed his party’s commitment to enact the CDA within a year. Furthermore, the NDP is the only party to have a committee set up to constantly critique the party’s direction. The committee’s job is to meet with community agencies, listen to their advisement and consequently “hold the party’s feet to the fire”, if they alienate stakeholder rights. Alternatively, the Green Party has advocated to design a national equipment fund so that people with disabilities can exercise their right to live independently. Thirdly, I was impressed by the turnout and audience participation. Peoples with disabilities were very well-represented and their questions were very specific to their disability. It was exciting to see such human agency from the group. Such a high attendance of persons with disabilities helped solidified the rights and equality rhetoric that accompanied most of the discussion. There was a wide representation of the disability community including persons who are blind, deaf, using mobility devices, having episodic disabilities, cognitive disabilities, learning disabilities, etc. This stressed upon me the importance to try to remedy the current situation regarding persons with disabilities. As a political party looking to get elected, it not only makes sense to move forward because it is proper (and moral) to have disability rights enshrined in legislation, but also because persons with disabilities represent such a large portion of the vote.